When visiting Charleston, one of the top things to do is going out to see Fort Sumter, known for being the site where the Civil War began. Visitors are transported back in time and are able to explore and learn about the well-preserved fort ruins and the Civil War itself. South Carolina seceded from the Union on December 20, 1860. Six days later, Union officer Maj. Robert Anderson moved his men to Fort Sumter in an effort to protect them from the Confederates; the fort was heavily fortified and in the middle of the Charleston Harbor. Confederate forces were very upset that Union forces were in the area and on April 11th, 1861, Confederate Brig. Gen. P.G.T. Beauregard demanded that Anderson surrender the fort. Anderson refused. The next morning, at approximately 4:30am on April 12th, 1861, the first shots of the Civil War were fired upon Fort Sumter. For 34 hours, Confederate forces fired upon the fort. Union forces fired back sporadically as they were running dangerously low on supplies. Then on April 13th, Anderson reluctantly surrendered the fort. Surprisingly, no soldiers were killed during the bombardment. Additionally, the Union soldiers were allowed to march out of the fort and onto a boat that took them to Union ships that were waiting for them outside of the harbor. Fort Sumter is only accessible by boat. You can visit it for free by private boat, but most people take the Fort Sumter Tour that leaves from either Liberty Square in downtown Charleston or Patriots Point in Mt. Pleasant. The tour company provides the only commercial boat transportation to the fort and is an authorized National Park Service concessioner. We left from Liberty Square, which is conveniently right next to the aquarium. There are only 2 departure times a day from Liberty Square (11am and 2:30pm) and 1 from Patriots Point (1:30pm) so plan accordingly. You learn so much on this tour! The boat ride takes about 30 minutes, during which a narrative plays that points out historic landmarks as you pass them and also starts explaining the events that lead up to the Civil War. Once you arrive and dock, you’re greeted by a National Park Service Ranger. Unfortunately, I don’t remember our ranger’s name but she was awesome. I loved her enthusiasm! After a few rules and safety tips, we stepped off the boat and headed inside the fort. Once everyone was inside, we had the option to start exploring right away or stay with the park ranger for a few minutes while she passionately and ardently explained the events that took place on the fort. We chose the latter. Once she was done, we began walking around the grounds. We had an hour to explore the fort and take a quick look inside the museum and souvenir shop. A small replica of what Fort Sumter had looked like. This 10 foot by 20 foot flag flew during the bombardment at Fort Sumter. I know history buffs would absolutely love visiting the fort, but I think anyone would enjoy exploring and learning about such an important time in the history of the US. – While you’re on the boat you can either be on the first level that is covered or on the second level that is open to the elements. It gets a lot windier and cooler on that second level so it might be a good idea to bring an extra layer of clothing. – Buy your tickets ahead of time! Since there are limited daily departures, I highly recommend not waiting until the day of. You can buy your tickets online at the Fort Sumter Tours website. – You can’t bring food onto Fort Sumter. Luckily, drinks and snacks are sold on the boat. If you don’t want to buy snacks though, I recommend eating beforehand. Between the boat ride to and from Fort Sumter and the hour on the fort, the tour lasts just over 2 hours so keep that in mind. Have you been to Fort Sumter? What are some other things to do/see in Charleston? We’d love to read your comments below! Your tips are really useful for people who are thinking to go! Thanks for putting this together. Nice post with lots of handy information. This sounds like a great way to learn more about America’s rich history! Oh, it definitely is Kim! I love Aouth Carolina. When we lived in North Carolina, we would visit all the time. The southern boat rides like this are always a great time. They are, I’d love to go back and take some more boat tours. Nice! Ten years ago, I was a nanny in Spartanburg… but never made it to the Fort..Looks like a cool day though! It was a really interesting time, I loved it. I like learning history. This looked like a fun time on a beautiful day. I love historical museums and heritage sites. I visited South Carolina in fall 2015, but sadly did not have time for Charleston (the horror!). A wonderful reason to return to this great and interesting state. Definitely Claudia! I’m sure you’ll enjoy it. How great! So much history and the tour sounds great! 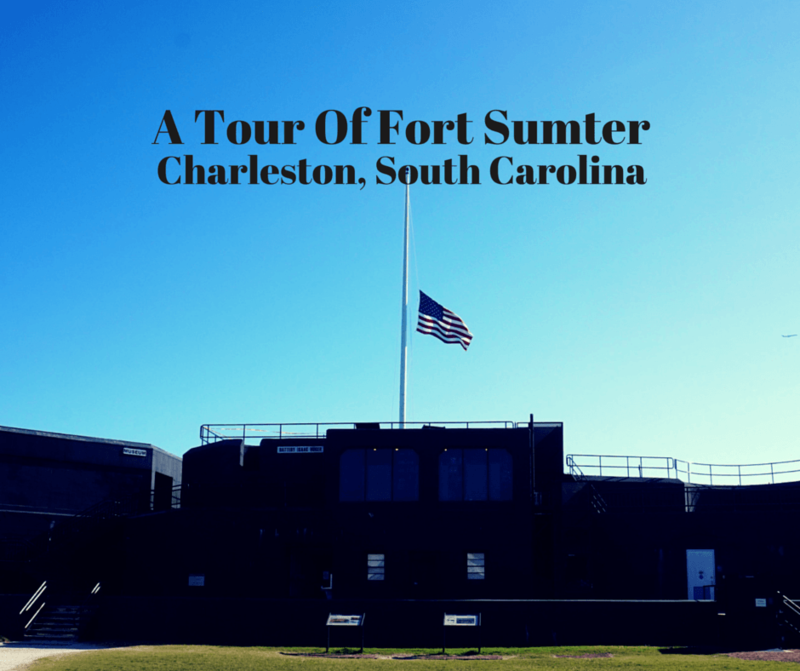 We’ll definitely be wanting a tour of Fort Sumter when we head that way!